Barbara Davis Gallery is pleased to announce the upcoming solo-exhibition, Jawbreaker featuring internationally recognized artist Gavin Perry. The exhibition opens on Friday, November 16, with an artist reception from 6:00 - 8:30 PM. ​The works in “Jawbreaker” are the culmination of more than a decade long investigation into the interaction of antithetical agendas. Starting very early on, my painting practice developed (and has maintained) an affinity for the work of the Southern California artists working in the language of “finish fetish”. Like them, I choose industrial materials over traditional artist media to create works with jewel-like surfaces. Consistent within this aesthetic, I also choose to incorporate geometry and pattern in the image making. The works that emerge out of this process are stoic but brightly colored, at once ingratiating and de-personalized. As I developed along this line, the world around me seemed to increasingly be one defined by urban demolition and gentrification. We are talking, after all, about a time of unyielding luxury condo markets and the subprime debacle. A pressing need to register in the work the entropy I was witnessing daily, began to make itself felt. It demanded an expansion of my visual vocabulary. Rather than change course, I chose to superimpose on the refined surfaces I was producing more aleatory elements and gestures. Generating this disjunction was a way of representing my reaction to unending and hyper-accelerated urban renewal/decay. 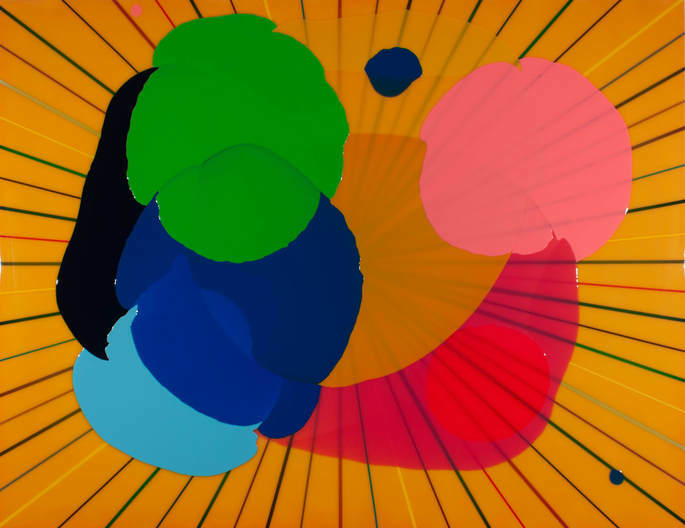 The random pours that spread across paintings, such as “Jawbreaker” are a virus, an agent that strives to challenge and suggest the potential disarticulation of the calculated and controlled line work. Partially obscuring but never obliterating the surface beneath them, these slick pools of resin delineate the history of a process that pulls in two directions simultaneously. They serve as a metaphor for the complex ways in which differing value systems, and their visual vocabularies and attendant modes of life, have to negotiate with one another, testing provisional syntheses that never fully settle. Gavin Perry was born in Philadelphia, Pennsylvania, in 1971, and currently lives and works in Miami. He received a BFA from Tyler School of Art, Temple University. Perry's exhibitions include Miami Art Museum; Art Basel, Basel, Switzerland; White Box, New York; Bass Museum of Art, Miami, Florida; Buamet Sultana Gallerie in Mexico City and Paris, France; and Barbara Davis Gallery in Houston, Texas. Perry is a recipient of the prestigious South Florida Cultural Consortium, which included an exhibition at the University Galleries of FAU. His work has been reviewed by Flash Art, Art in America, ARTnews, and Art Papers, and he was named an Artist to Watch in 2011 by The Art Economist.